The Scranton Volunteer Fire Company, Inc. was founded in 1933 to provide fire protection to the residents of the fledgling Scranton Fire District. At that time, there were approximately 15 active members in the fire company and their lone piece of fire equipment was a 1914 Model T purchased from the Village of Hamburg Fire Department for $1.00. Since the company had no building as of yet, the truck was housed by using the garages of several members on a rotating basis. It wasn't until 1937 that our founding members were able to gather enough funds to erect a simple, wood frame building on the same Scranton Road site where Station #1 now stands. We the members, of the Scranton Volunteer Fire Company, Inc. express our appreciation to all those that were instrumental in its founding and the continued devotion to our fellow man and community. It is with deep regret that personal recognition cannot be given to all those who voluntarily gave so much of their time and knowledge to the formation and advancement of this company. We salute the wives, mothers, families, and auxiliary members. Without their continual understanding and support, the company would not be in the position it is today. We therefore pledge our continued support to the high ideals, which our predecessors have set and dedicate this historical booklet to the memory of those who are still with us. 1933- In January S.V.F.C. was officially started, with the first officers elected and the first By-Laws enacted. The same year, obtained a 1914 Model-T Ford from the Village of Hamburg, which is still in operation today. 1937- Construction of a large hall was started and completed the following year. 1940- Purchased a 1928 LaFrance Pumper from Bethleham Steel Cord., lasting twenty years. 1959- Emergency First Aid Squad was formed. 1974- The company dedicated a new sub-station (Station #2) in the Carnegie area. 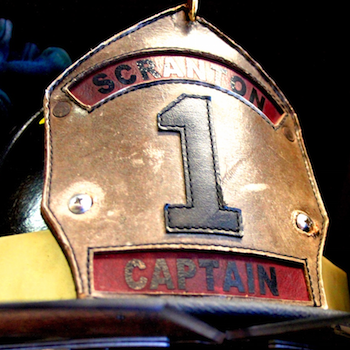 1978- In December, a special committee was formed to lead and advise the newly formed Scranton Junior Firemen. 1980- Activities centered around the purchase of a Port-A-Power Unit, and built-in generator with quartz lighting system for their Rescue Truck. 1983- Commemorated its 50th anniversary. 2008 - Commemorated its 75th anniversary.